This is the one! This completely redone 3 bedroom, 2 bath home is in the highly desirable Sunrise Park neighborhood. 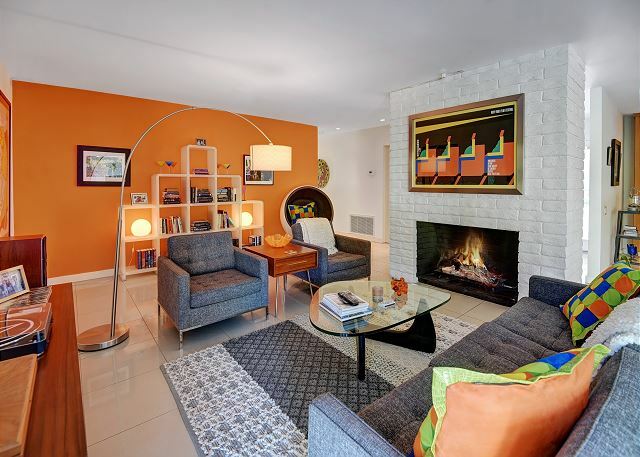 All the amenities and comforts you want, wrapped in a chic mid-century modern package. The house has been totally remodeled. Enter through double glass doors to the open living area. The updated kitchen with stainless steel appliances is stocked with everything you could need to cook and serve a gourmet meal. Gather around the modern dining table that seats 6, or take advantage of the Palm Springs weather and eat at the covered outdoor dining table. The living room boasts a large screen HDTV and gas fireplace for gathering to watch a movie or chat over cocktails and appetizers. 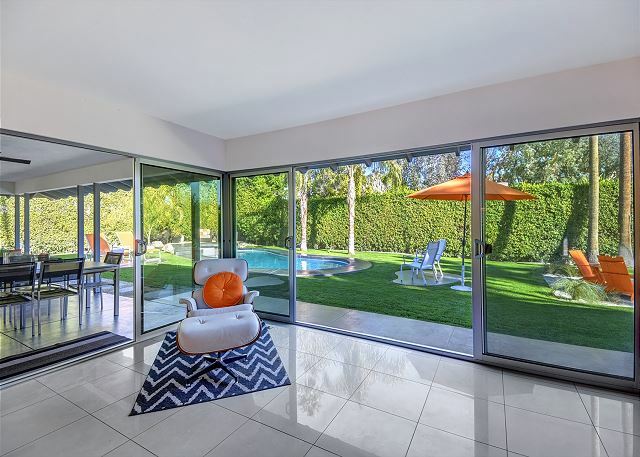 The house is designed to make the most of Palm Springs indoor/outdoor living. Walls of glass open to the large salt-water pool and spa with beautiful views, and the multiple outdoor seating and lounging areas. No matter if you want shade or sun or both, you'll find a place to relax by this pool. There is also a covered patio with the outdoor dining area, covered seating area, and an outdoor fireplace (note that due to city noise ordinance the outdoor TV does not work). The huge yard has lots of open grass and mature fruit trees. The master bedroom features a king platform bed, luxury linens, ample closet space, and a fantastic bath (with direct pool access). The two guest rooms are both quite spacious and each has a queen bed. They share the updated and remodeled guest bath, with vanity and large shower. Whether you're a group of friends or a family, this is the Palm Springs experience you've been looking for! Relaxing place with a great view. This was one of the cleaner places we have stayed in and the kitchen was fully stocked. They also provided plenty of plastic dishes and cups for the backyard/pool area. We would definitely stay here again and recommend it to others! The backyard was nice and big and felt very private. This house is good families but if you have a crawling baby or curious toddler it could be a bit more difficult (ex: tile floors, glass decorations, accessible locks on back door). However our family loved it and spent most of our time in the pool. It's also really close to downtown which is a plus when you want to eat out. This was a very nice home - 4 women on a retreat/get away. We loved the privacy of the back yard - the pool is small but was fine for us - but not if you want to swim laps. The hot tub was fantastic. The location was closer to the airport than we had realized and bcs there was a tennis tournament in PS that weekend the jets coming and going were non-stop, morning to late. Lots of private jets coming in to watch Serena and Roger play tennis! Our tennis fan friends could not believe we did not go. But we were happy lounging pool side and enjoying PS. A few complaints about the house: the manual says free Canadian calls (we are Cdn) but there was no phone. There was also not a single way to play music and it did not occur to us to bring a player to a higher end rental. Altamira came over and found them both locked up and gave them to us. They were very responsive when we called and fixed our ice maker pronto. But here is some annoying irony: we got a music player after written and verbal warnings about playing music in the house (and NEVER in the yard). But meanwhile, our peace was broken the entire time, from Thursday to Monday, by both house renovation/construction and garderners buzzing the hedge (which took 2 full days). We shared this hedge with the neighbours and the noise from their house was non-stop and loud. Finally, on Sunday, after the sawing started at 8am and was still happening at 4pm we yelled over the fence and asked them to please call it a day (in a nice way). They told us half an hour more.....This is no fault of the house owners or the rental agency but does make the music prohibition absolutely ridiculous when there are a steady stream of jets over your head and non-stop construction. If there had been any way to know that our neighbour was in the middle of construction we would not have rented the home. Outstanding. Clean, great location, better than advertised. Amazing time, such a beautiful house and so relaxing. This home was the perfect family retreat. It feels like we were on our own little private island. The home and the grounds were well done and very clean. The pool was amazing! Altamira is one of the best managing companies in Palm Springs. Everything was awesome and easy. Highly recommend! This house is amazing. We have rented from Altamira in the past and, as always, it was a great experience. It's such a nice, quiet neighborhood, very conveniently located, close to downtown. Our kids loved staying here; the only issue was the bathroom sinks are all too tall for even my 10 year old to reach...might be helpful to bring a small folding stool if you have kids (or are short yourself). Also, the pool is quite small, was ok for the 4 of us but I can't imagine having more people than that in there. Overall, the house was wonderful and we had a great time, will definitely be back! Everything was exactly as described - or better! 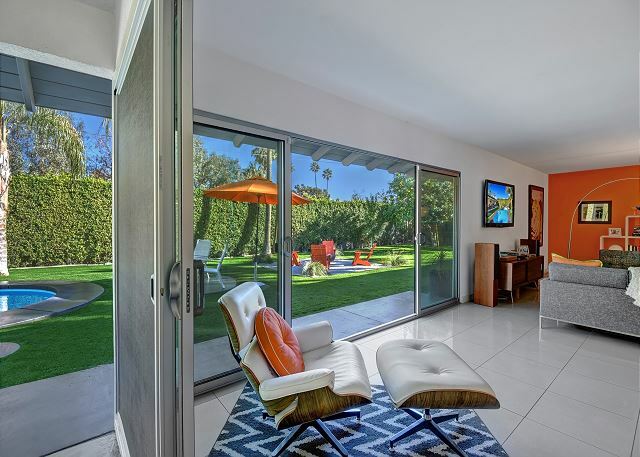 House was wonderfully appointed, comfortable and allowed for a perfect vacation in Palm Springs. Would have liked to have been a bit closer to town, but that was minor inconvenience that was more than made up for by the great accommodations. I thought the photos in this listing were great but this home exceeded our group's expectations the property was fully equipped and incredibly organized. I have stayed at other mid-century style properties in Palm Springs that felt cold and uncomfortable, but 7 Palms was warm, colorful, upbeat and very comfortable. Not to mention the incredible outdoor space. Cannot recommend enough. Beautiful house and garden and a very professional host. Would love to go again. Thank you! We loved our stay at this beautiful property. It provides the perfect indoor outdoor experience that defines Palm Springs. The people at Altamira Vacation Rentals were incredibly responsive to every need and a pleasure to deal with. Our stay was wonderful. Highly recommend. What a positive experience both with Altamira and with the home. The owners paid all attention to detail in their design and decorating. The home was convenient, comfortable and everything that the pictures and write-up depicted. Beautiful! Altamira went above and beyond to make our stay perfect. They were quick to respond to questions, they addressed needs that we had, and we will absolutely book our next Palm Springs rental through them! This house was perfect! It had all the amenities and more for our family. This house is fantastic, with gorgeous architecture, artwork, and atmosphere without being too fancy or pretentious. Beds are very comfortable, in fact the whole property is very comfortable. Pool/jacuzzi setup was awesome though we did have some minor issues that were addressed quickly and decisively by Michael, the property manager. Not really walking distance to any commercial stuff but that was minor, 2-5 min drive from everything and nice to be on a quiet street with excellent privacy in the backyard behind huge hedges. We had a blast here and would definitely stay here again. Great home, even better back yard. Few friends and I stayed for a weekend. Not only did we not leave the house the whole time there, didn't want to leave at all. Had everything you need for a great getaway with the exception of one small detail; no toaster. Other than that the stay was great and I would recommend this place to everybody.